Leading Manufacturer of red fused alumina abrasives and silicon carbide from Jaipur. Red emery-basically a low grade Black Fused Alumina. Flint- a hard, sedimentary cryptocrystalline form of the mineral quartz. BlackEmery- a course compound and is primarily used for cutting and preparing materials to be buffed out for a mirror finish. AluminumOxide- can be recycled many times and used as abrasive grain in sand blast finishing and surface preparation. 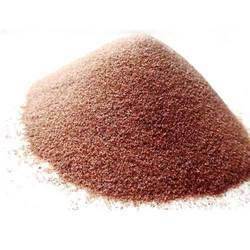 CopperSlag- an abrasive blasting grit made of granulated slag from metal smelting processes. Walnut Shell Grit- hard fibrous product made from ground or crushed walnut shells. Corn Cob Grit- a safe blast media used for removing contamination, debris and coatings from furnace. We are offering Silicon Carbide to our valuable client. Looking for Fused Abrasives ?